The Bundaberg Christian College takes sustainability seriously. They already have their own water treatment plant as they are not connected to town water; they harvest all water collected from roofs and process it for drinking water and all sewerage is processed for use on gardens and ovals. A solar and storage system was required as part of a major energy efficiency project. The solar and storage system had to integrate seamlessly with existing initiatives. The PV array needed to be installed in a way that didn’t affect the school’s ability to collect water. The system also needed to be correctly sized to take into account further energy efficiencies such as the change from fluorescent lights to LEDs. 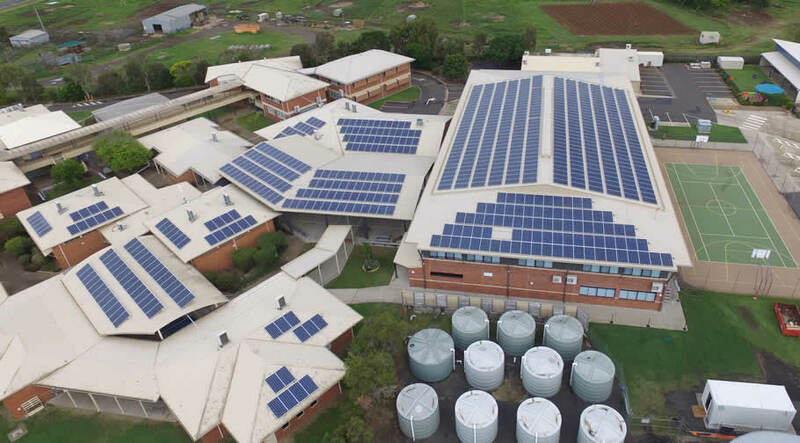 The result was the largest solar hybrid system to be installed in an Australian school. It was a complex installation consisting of over 700 panels mounted across a number of campus buildings in a variety of orientations. The control and battery component of the project was housed in an onsite 20-foot storage container consisting of a three-phase SP PRO system and the battery bank. The changeover to LED lights reduced the load so the size of the PV array was smaller, resulting in cost savings. The system is expected to reduce reliance on grid electricity by approximately 80% resulting in annual savings of up to $100,000. With these savings, the system should pay for itself in seven years. The replaced flouros were not wasted but rather donated to a school in Vanuatu that had suffered damage due to Cyclone Pam.